I leave for Italy in two days. As such, I HAD to talk about Italian wine for this week’s Thirsty. And with all the busyness of THAT, I’m a little behind in my writing, with about three posts sitting in draft mode. So apologies for this being one day late! A wine that has been tasted previously, but not on that night, is perhaps a wine from one of Italy’s finest white grapes: Verdicchio. 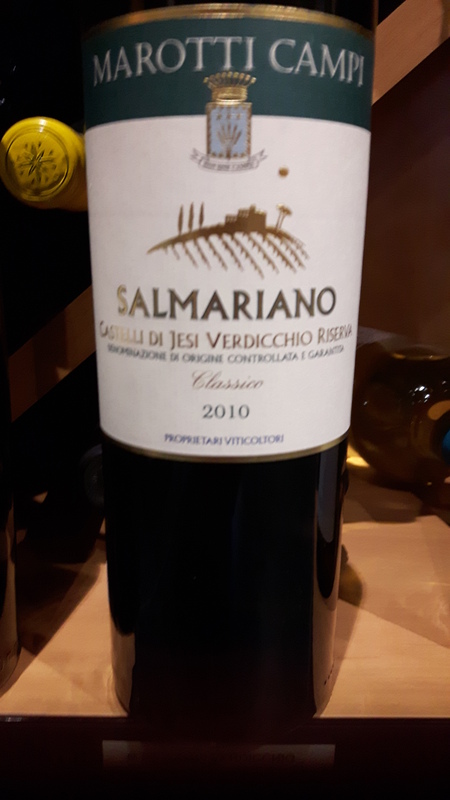 Found in Marche, Veneto, Lombardy and Lazio (but mostly Marche), today’s example is from the DOCG of Castelli di Jesi Verdicchio Reserva. Already with those four capital letters of DOCG, I’m expecting good quality! The cool thing about this grape is that it has high levels of acidity which means it can be refreshing in youth, but also has the ability to age. Nice. It’s also a grape that wears many hats in the form of styles. It can be dry, sweet or sparkling. Nice! I personally love this wine! A small amount of oak was used to give this wine Chardonnay-esque qualities, but for those that are ABC, this is a fantastic alternative. This is a bright lemon yellow colour with lovely floral aromas, minerality, and of course that slight vanilla on both the nose and palate. 20% of the wine is aged in small barrels along with ageing on the lees that gives it that creamy edge. Quite full body on this with an intense, lasting finish. Perfect with food such as fish or poultry, or just for sipping. All this for a great price of $31.95 on the shelf! Stay tuned for more Thirsty in about two weeks time! I’m off to Italy tomorrow! Cin Cin! This entry was posted in Thirsty Thursday, Varietals, wine and tagged Italy, Marche, minerality, Thirsty Thursday, Verdicchio, white. Bookmark the permalink. Marcia is off to Italy, Ciao darling and have a terrific time! Safe travels! Have a great trip!! !